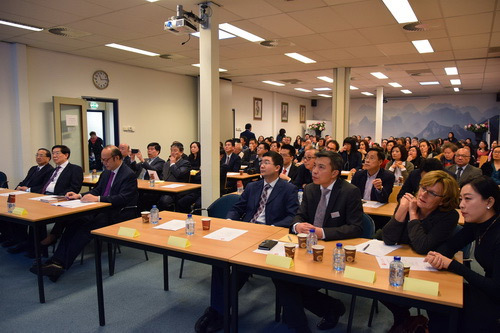 On January 10, 2016, the Association of Oversea TCM in Netherlands (hereafter referred as Vereniging TCMned) successfully held its founding conference at the teaching building of Shenzhou Open University of TCM in Amsterdam, the Netherlands. Chinese Ambassador to the Netherlands Ambassador Chen Xu and Consul Jiang Hua, Chairman of the Nederlandse Vereniging voor Acupunctuur (NVA)Coquita van der Harst, Chairman of the ZHONG (Nederlanse Vereniging voor Traditionele Chinese Geneeskunde) Wang Weixiang, and more than over 120 overseas Chinese people, including Chinese medicine doctors from the Netherlands, attended the founding conference. 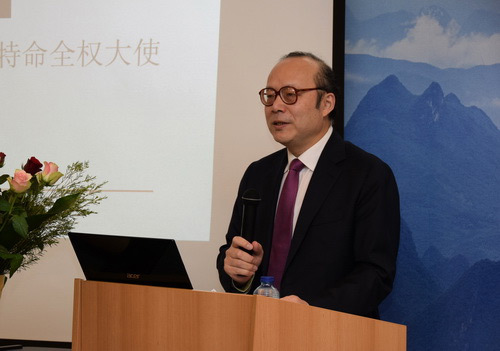 Hosted by the vice president of Vereniging TCMned Ren Tianrong, Mr. Dong Zhilin firstly introduced the current development of Chinese medicine in the Netherlands. It was followed by an important speech by Ambassador Chen Xu of the Chinese Embassy in the Netherlands. 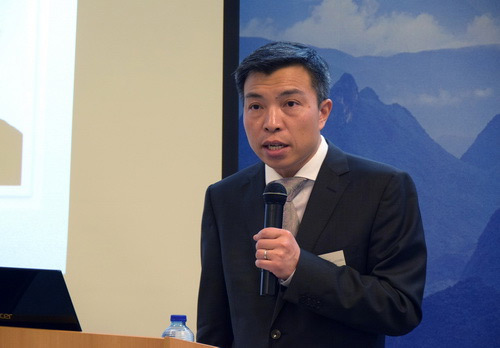 Seen from the perspective of the internationalization strategy of Chinese medicine development in China, Ambassador Chen Xu the Society expected that Association will better promote the development of Chinese medicine in the Netherlands. Chairman of NVACoquita van der Harst, Chairman of ZHONG Mr. Wang Weixiang, vice president of Vereniging TCMned Li Jie, gave separate speeches. At the end, Mr. Qian Cheng, the Standing council of Vereniging TCMned read several congratulation letters from the foreign affairs department of the Overseas Chinese Affairs Office of the State Council, the International Cooperation Department of the, International Cooperation Department of Chinese Medicine Administrationand the World Federation ofChinese Medicine Societies, and the World Association of Acupuncture and Moxibustion. Chinese acupuncture was first introduced to Europe by three Dutch people more than 300 years ago. It really got started in the 80s in the Netherlands. In the early 1980s, there were only more than 30 acupuncturists in the Netherlands. There was only one Chinese acupuncturist. So far there are more than 4,000 Chinese acupuncturists in the Netherlands, including about 200 Chinese acupuncturists. There are more than 2,000 TCM clinics in the Netherlands, 60% were mainly acupuncture treatment; 30% were acupuncture plus Chinese herbal medicines and 10% Chinese Tuina massage plus acupuncture treatment. On August 30, 2015, more than 100 Dutch Chinese TCM practitioners gathered in Amsterdam and successfully hosted the election meeting of Association of Nederlandse Oversea Chinese TCM. After a democratic election, the first council was elected. 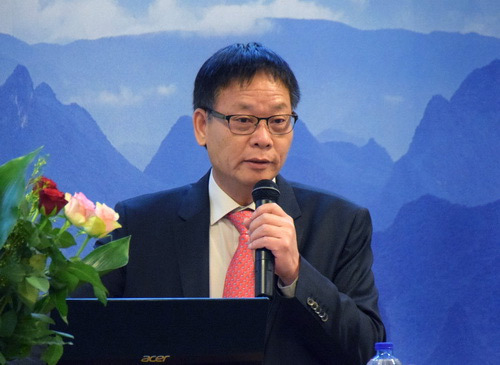 Mr. Dong Zhilin was elected as president, Mr. Li Jie and Ren Tianrong, the vice president. The secretary is Liao Xiuying, the treasurer is Zhao Pingzheng, and the director is Qian Cheng (Educational education) and Yang Zhigang is Public Relations officer. Every citizen in the Netherlands needs to purchase statutory basic medical insurance, plus additional insurance. Acupuncture treatment is recognized by most medical insurance companies, and acupuncture treatment costs can be 70% to 100% refunded. In recent years, Chinese medicine and Tuina massage have gradually been recognized by more medical insurance companies. The practicing qualifications of Chinese medicine practitioners are generally recognized by different Chinese Acupuncture Associations in the Netherlands. Chinese acupuncturists or tutors who graduate from Chinese medicine schools can join different professional associations. If someone is graduated from Chinese TCM colleges, their diploma must be certified by the Netherlands Higher Education International Cooperation Foundation (NUFFIC). Or they need to participate in the last year class of the local Chinese medicine school. After they pass the exam, they can also join the associations. There is also requirements for Dutch language demand. If they open their own clinic, you need to set up a company and register at the local chamber of commerce. 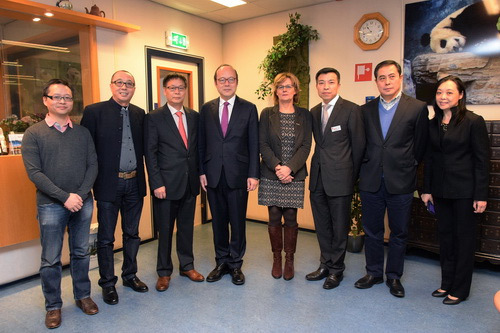 The Chinese medicine education in the Netherlands is currently run by Shenzhou Open University of TCM, Qingbai Academie voor Chinese Geneeswijze, Academie Boyi Chinese Geneeswijze and Traditional Chinese Medicine Academie (TCMA). The curriculum is designed as follows: for the first year student study the foundation Chinese Medicine, and then division of different specialties start from the second year. Two years of acupuncture, herbal medicine, and Tuina massage are followed. Each subject takes 3 years for 500 study hours (including clinical practice). If students don’t have a western medicine background, they must learn the basics of western medicine for 2 years, totaling 240 hours. When students are graduated from one subjects, they can learn another specialty. It will take another 2 years to finish. In the mid-1980s, some Chinese in the Netherlands Doctors sent a small amount of Chinese Herbal Medicine from Hong Kong and China to use them in their own clinics. It was only since 1990s that some companies started import and sell ready-made Chinese medicines, health products, and Chinese herbal medicines in the name of food supplements. Since 1stMay 2014, all unregistered health products for Chinese patent medicines have been banned by European Union, while Netherlands is the only country that can continue selling Chinese medicine. The condition is that Chinese medicines can be sold in the name of food or food supplements. Information such as ingredients, usage, dosage, expiration date and precautions has to be clearly stated in Dutch language. But it is never allowed to specify the indications. In Netherlands, there are about 200 Chineseacupuncturists scattered in several different TCM rprofessional associations, such as: Nederlandse Vereniging voor Acupunctuur (NVA), ZHONG (Nederlanse Vereniging voor Traditionele Chinese Geneeskunde), Netherlanse Artsen Acupunctuur Vereniging (NAAV), Netherlandse Traditional Chinese Medicine, Netherlandse“YI” Association of Traditional Chinese Medicine. Among other complementary therapy associations, there are also small of acupuncturists. These Chinese acupuncturists are lack of effective communications and information exchange, knowing little about of TCM information from official Dutch government and private channels. It is proposed to establish the TCMned, according to the current status of TCM practitioners in the Netherlands followed by a small-scaled public survey and rounds of discussions. The purpose of TCMned is to guide the Chinese medical practitioners in the Netherlands to abide by local laws and regulations of relevant industry associations, build up a medical communication platform, improve medical standards, better serve local patients in the Netherlands, protect the status of Chinese medicine practitioners in the Netherlands, help to find solutions to emergencies of Chinese practitioner and promptly inform Chinese medicine information from the Dutch government and industry associations.